Every week We Alaskans presents reviews of books about Alaska and the north, or books by Alaska authors. Nancy Lord of Homer and David James of Fairbanks have carried the load of all that reading — and writing. A number of other books get capsule summaries in our Reading the North section. As 2016 comes to a close, Lord and James once again looked back and selected a half dozen of their favorite Alaska books from this year's reviews. Without a doubt, this year has been exceptional for northern fiction, the best I can recall in more than a decade of reviewing. But I'm splitting my half-dozen favorite Alaska books of 2016 evenly between fiction and nonfiction. "The Alaskan Laundry" is the debut work by Sitka-based Brendan Jones. Set in a fictionalized version of his town called Port Anna, the story opens with the arrival of Tara Marconi in the fall of 1997 for a job at a hatchery and follows her for the next two years. Young, broke and escaping her past, she drifts through various jobs, living arrangements, friendships and conflicts as she immerses herself in the fishing industry of Southeast Alaska. In the process she confronts her own demons and pursues a dream for the future. Filled with memorable characters, most of whom came north seeking their last shot at life, and set against a turbulent yet beautiful backdrop, this book captures Alaska like few others I've read. "Secondhand Summer" by another first-time novelist, Dan L. Walker, also shines. This young adult novel set in 1965 follows 14-year-old Sam Barger from Ninilchik, whose mother moves him and his sister to Anchorage after their father dies. Stuck in a low-rent apartment on Government Hill, Sam hits the streets and falls in with three other troubled kids. Initial acts of mischief lead to more serious offenses. Sam finds himself caught between his conscience and a need for acceptance that prevents him from saying no when he should. The kids in this book are stricken by family problems and low incomes. Some are trying their best, some don't even know how to try. Walker explores their motivations and decisions, while their interactions drive the storyline. As with the best teen fiction, this book about growing up under difficult but not impossible circumstances will leave adult readers reflecting on their own youths. British author Ian McGuire has received some well-deserved year-end accolades for his second novel, "The North Water." Set on board a whaling vessel in 1859, it's the story of Patrick Sumner, a physician whose life was upended in India during the Sepoy Rebellion, and who sails north to find solace from his failures. Sumner's sins are many, not least of them an addiction to opium, and he's carrying a secret that could be his undoing. Some of his fellow crewmen are a good deal worse, however, especially a harpooner named Henry Drax lacking any personal restraint who commits a truly horrific act. Meanwhile the captain has criminal intentions of his own. What plays out is bloody drama worsened when the crew is caught by sea ice and forced to winter over, setting the stage for an Odyssey-like ordeal where the body count grows. This is literary splatter fiction at its best: dark, violent, tightly wound and impossible to put down. On the nonfiction side, Philip J. Hatfield contributes significantly to Arctic history with "Lines in the Ice," a collection of artwork and maps offering a visual chronicle of how Europeans encountered the far north. Drawing heavily from the collection held at the British Library where he is curator of mapping, Hatfield presents more than a hundred images, many of them rarely — if ever — seen in wide circulation. The maps begin with a piece of wood, carved long ago by a Greenlandic Inuit man to mirror a section of shoreline, and end with satellite photos. In between lies a progression of reproductions showing how Europeans imagined the Arctic when it was terra incognita, and what slowly emerged as explorers pushed their way along the northern shores. These maps are scattered amid countless drawings, paintings and vintage photographs. In his text Hatfield summarizes the centuries of exploration in brief chapters and reflects on how the Arctic impacted European culture. While his narrative covers no new ground, the imagery found here brings vivid perspective to this endlessly fascinating history. Eleanor Phillips Brackbill also went digging through history, specifically her family's. Her great-grandmother, Harriet Smith Pullen, founded Skagway's famed Pullen House, a high-end hotel during the post-Gold Rush days of the Gateway to the Klondike. Brackbill wanted to know how she got there. In "The Queen of Heartbreak Trail" Brackbill starts with Pullen's father A.J. Smith in antebellum Pennsylvania. Smith experienced a succession of tragedies and catastrophes as he married and slowly moved his family westward, finally landing in Washington state. From there Pullen fled north during the Gold Rush and became what her father never was: a success. This is a book about the forces that drove Americans across an ever-receding frontier, placing early Alaska history in the context of our nation's restless expansion as it was experienced by one family. Finally, publication of the second volume of "Windows to the Land," Judy Ferguson's sprawling collection of oral history interviews with Alaska Natives, concludes more than two decades of work by the Delta Junction story-collector. Through interviews with elders, leaders, athletes, activists and many others, Ferguson gives voice to dozens of people, weaving together a tapestry of stories exploring Native life and history through firsthand accounts and shared family lore. Every region of the state and all of the major Native groups are represented. I still have a big pile of books to review and others on the way. Stay tuned in 2017. I have to agree with David — this was a very good year. Although I certainly didn't read more than a fraction of the books written by Alaskans or related to Alaska that hit the shelves and e-readers this year, I can enthusiastically recommend the following. These are all by writers who live (at least part time) in Alaska, and represent long fiction, short fiction, memoir, graphic narrative, essays and history/political science. Pull up a comfy armchair, and indulge in some satisfying winter reading. 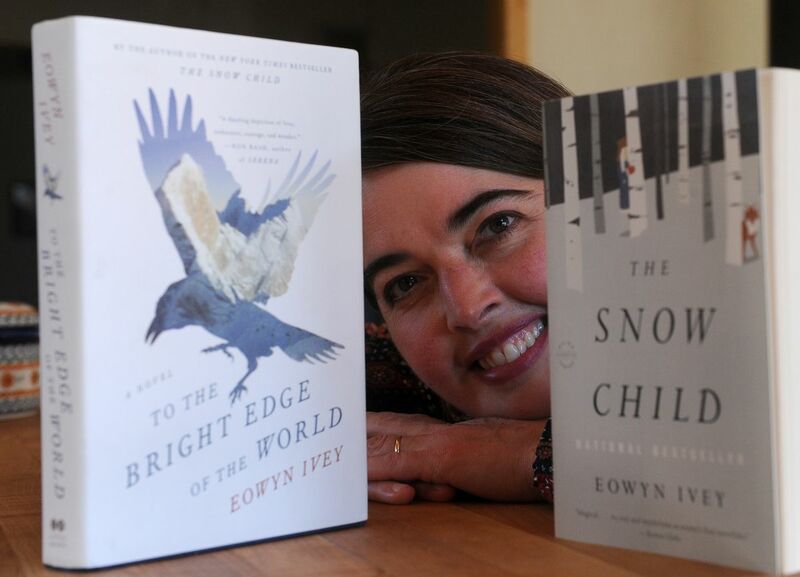 Alaskan Eowyn Ivey, whose previous novel "The Snow Child" was a Pulitzer Prize finalist, has returned with a stunningly brilliant new work. Beautifully written, fast-paced, wide-ranging, historically based, and creatively imagined and structured, "To the Bright Edge of the World" takes readers on an adventure into both wild Alaska and the hearts of strong and companionable characters. It delivers in all the ways a great novel should — with plot, characters, language and mystery converging in a highly original story. Inspired largely by the real-life 1885 expedition of Lt. Henry T. Allen to ascend the Copper River into Interior Alaska and westward, a 1,500-mile wilderness feat compared at the time to Lewis and Clark's journey across the American West, Ivey has gone beyond the usual concept of historical fiction to create something both recognizably true and magical. Her fictional Wolverine River and the lands beyond it, with their splendor and physical challenges, are vividly captured. And then, drawing upon Alaska Native stories recorded by locals and anthropologists in the region, Ivey has enlarged the experience with supernatural — yet still believable — elements. Just as Alaska becomes more culturally diverse, so does our art and literature. Bryan Allen Fierro, an Anchorage firefighter and paramedic, joins the ranks of Alaska's finest literary writers with the publication of his first book of fiction, a short-story collection set in the Latino communities of east Los Angeles, where he grew up. "Heart" may be the key word for all 11 stories that comprise "Dodger Blue Will Fill Your Soul." In each one, individuals are reaching for connection to others, and the caring they express — however awkwardly in some cases — brings their lives into sharp, and empathetic, focus. A reader has the sense that Fierro knows each of his characters intimately, and that he loves them all. He brings each onstage — no matter their circumstances — with affection and humor. The title story, about a Dodgers fan, and several others feature boys trying to figure out how to be men in a culture that is historically, or perhaps stereotypically, "macho." Juneau's Ernestine Hayes, author of 2006's award-winning "Blonde Indian: An Alaska Native Memoir," has returned with a second memoir that builds upon the first in deeper, richer and more provocative ways. "The Tao of Raven" is a memoir that defies the usual definition of "memoir" to present a life, and "life," in great wholeness. Readers will find themselves pulled into a multi-layered narrative of remarkable creativity, historical understanding, philosophical insight and empathy for all those — living and nonliving — who share the Earth with us. Everything here connects — just as in life. Indeed, if there's a single thread that pulls through the entire fabric, it's this truism. Even the book's title suggests this expansiveness. Hayes weds the ancient Chinese idea of tao, meaning a way, path or principle, to the character of Raven, prominent in Alaska Native mythologies. "The Tao of Raven" should be widely read, in and out of schools, if Alaskans are to understand something of what it means to belong to this place and the history that brings us to this moment in time and our relationships with one another. Ernestine Hayes is a gifted and gifting teacher, opening for us a box of light. When Peter Dunlap-Shohl, the former editorial cartoonist of the Anchorage Daily News, received a diagnosis of Parkinson's disease at age 43, he saw his whole world collapsing. Thirteen years later, he delivered to us an astounding work in the form of a graphic narrative that documents — in a formidable blend of intellect, emotion and humor — the experience of living with Parkinson's. We learn basic facts about the disease and so much more from Dunlap-Shohl's honest and honestly engaging account of his journey, from his initial depression through all of his learning and experience with the disease. Most of us likely know at least one person with Parkinson's, and to now have this incredibly informative text allows us to understand the disease in a fresh, bold, visual and visceral way. Those who may find themselves with the unfortunate diagnosis will have a helpful guide, and the rest of us will be reminded that life is tenuous and best held with gratitude. Those of us concerned about climate change and other environmental threats (extinctions, pollution, habitat loss, etc.) often find ourselves sinking into despair — or, at the least, struggling to find useful responses. In "Great Tide Rising," Moore — a distinguished professor of philosophy at Oregon State University, who taught critical thinking and environment ethics for many years — offers some openhearted ways of facing global change. This is a book to shake loose our doom-and-gloom attitudes and encourage us to ponder, positively, the questions she poses. Why is it wrong to wreck the world? What are our obligations to the future and our children and grandchildren? How can clear thinking dispel misinformation and illogic? What can anyone do? And, how can stories inspire us to move forward with clarity and moral courage? Post-election 2016, these questions are more critical than ever. At heart, Moore is a storyteller, and the strength here lies not with didactic preaching or even the presentation of ideas as such, but in the collective questioning and innovative thinking she invites readers into through stories. In "Battleground Alaska," historian Stephen Haycox, a longtime Alaskan and distinguished professor emeritus at the University of Alaska Anchorage, thoughtfully explores the complex relationship between a state dependent on economic development and a federal government committed to protecting some of our country's last untrammeled land. The book focuses on four now-classic battles involving federal land in Alaska: the establishment of the Arctic National Wildlife Range (now Refuge), the approval of the trans-Alaska oil pipeline and the settlement of Alaska Native claims, the passage of the Alaska National Interest Lands Conservation Act (ANILCA), and conflicts over the use of the Tongass National Forest. It also extends discussions to the proposed Pebble mine in Bristol Bay headwaters, the proposed Chuitna coal mine on Cook Inlet and the debate over a road through a wilderness portion of Izembek National Wildlife Refuge. With a new government in Washington, this well-researched book has fresh relevance. Regardless of where one stands on any of the issues, past and present, "Battleground Alaska" lays out a useful — and very readable — portrait of what's at stake. Not everyone will agree with the author's analysis, which is why it should be read and then debated in classrooms, boardrooms, bar rooms and the backrooms where political decisions are made.